Artists seem to have a profound effect on the public perception of woodlands. When we think of British woodlands many people will think of paintings by John Constable or Joshua Reynolds. But our view of woodlands is changing as new images are produced, whether in advertising or by contemporary artists. A couple of years ago David Hockney experimented with a new technique, producing a series of pictures of woodlands in the Yorkshire Wolds using an iPad which were notable in several ways - they used vivid colour and bold, stylised lines to give one perspective on Yorkshire woodlands, but they were also taken from a particular perspective. Hockney personally feels the cold and he isn't very agile now as he gets towards 80 (born 1937) so he did this series of paintings from his car and many of them feature the road itself and the verge. 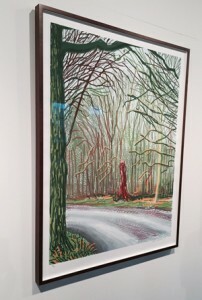 Hockney was consciously or otherwise showing trees as they are seen by the majority of the British public in a car-dominated society. 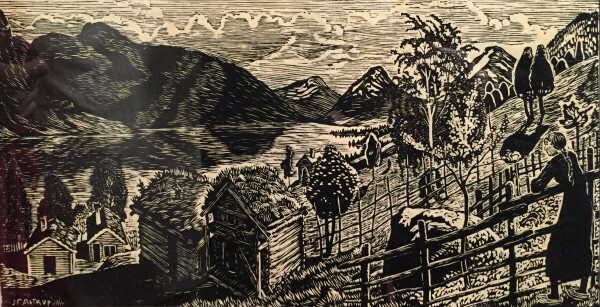 A recent exhibition by the Norwegian artist, Nikolai Astrup (1880-1928), also has a particular perspective - he lived almost all his life in a the village of Jolster in rural Norway and many of his paintings are of the same few views from Jolster. For example he repeatedly paints what he and many Norwegians see every day: a lake, the mountains, a stream, and birch trees. 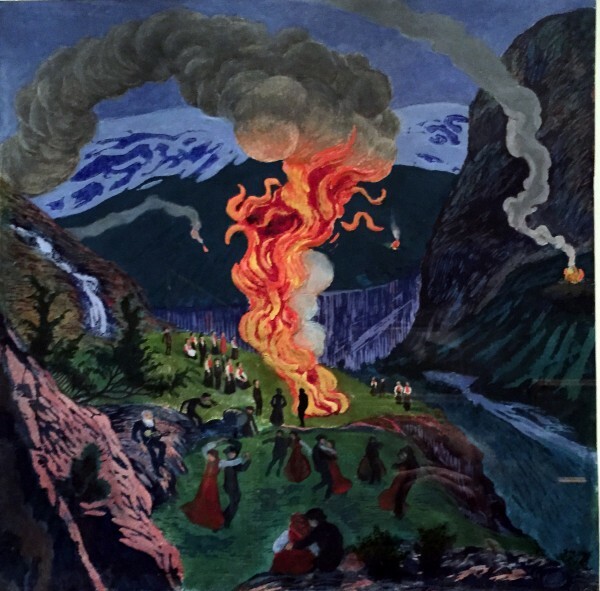 These themes are well illustrated in the first exhibition of his works outside Norway which is on now, and runs until 15th May 2016, at the Dulwich Picture Gallery in London. 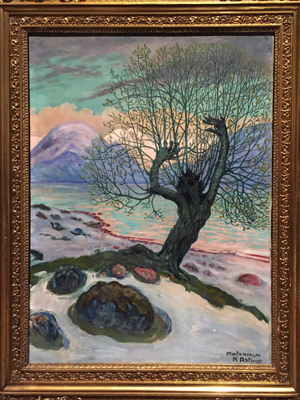 He was a contemporary and rival of Edvard Munch who painted "The Scream" but Astrup was much brighter in both colour and mood. Unlike Hockney who has achieved fame and wealth in his lifetime, Astrup lived in genteel poverty - his finances were probably not helped by having to support eight children. 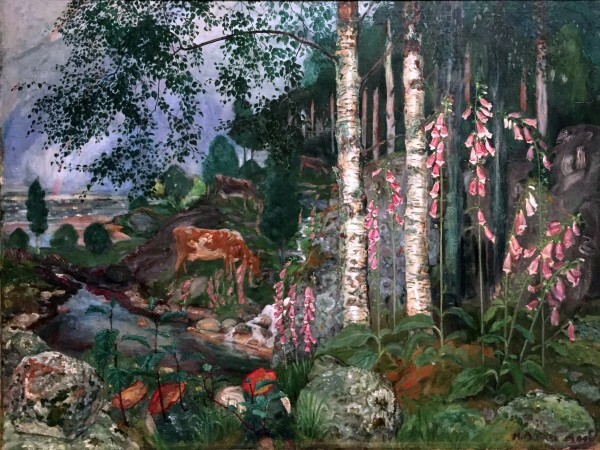 He lived by selling his paintings to friends who bought them somewhat out of pity and sympathy - since his death, of pneumonia at the young age of 47, his paintings have been widely recognised and now sell for over $500,000 each and, money aside, he has a whole wing of the Norwegian Gallery in Bergen (KODE) given over to his work. He has shaped how Norwegians see their country and helped build the mystical vision of nature that is common in Norway. So, these artists in Norway and Britain have captured what's important to them when they look at the natural world but such images easily become embedded in our national psyche and we start to see the world in their terms. Hockney sees the woods from the road and in stark colours with stylised lines whilst Astrup sees the woods with people in and nestled between his lake and the mountains. Can we ever really see trees and woodlands without the overlay of other people's interpretations? It reminds me of David Attenborough's favourite reply when people ask him to explain how he got his constant curiosity about nature - he says that all small children have a fascination with the natural world and he says the real question is, "How did you lose your curiosity?"